Regular readers will be familiar with my use of the Widows and Dependents Pension Files housed in the National Archives as the main building-block for the stories on this site. I contend that these files likely represent the most important source of detailed family-level social history available anywhere in the world on 19th century Irish people. The key element in these applications is the affidavit– the sworn statements of prospective pensioners and their supporters. It is in these statements that we gain the most insight into the lives and experiences of these emigrants, and can draw inferences relating to topics such as chain-migration and emigrant community cohesion. I rarely present these affidavits to readers in their original form, choosing instead to source information from them and craft a narrative history of the family. This post takes a different approach. To provide readers with an idea of how these affidavits appear in their original form, I have reproduced a series of them relating to a single Irish emigrant family, the O’Donnells of Co. Donegal. 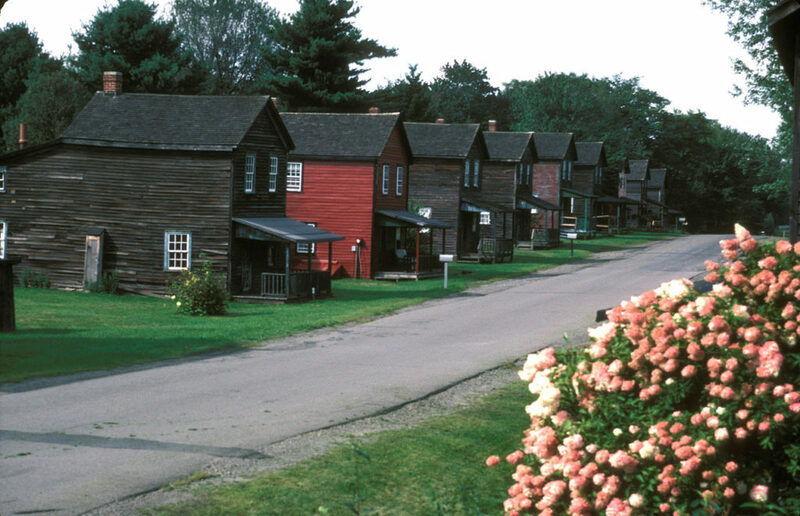 They had their origins on Cruit Island in the Rosses, and settled in Pennsylvania Coal Country. Arranged in chronological order by date of deposition, the affidavits were given across seven years in the 1860s. 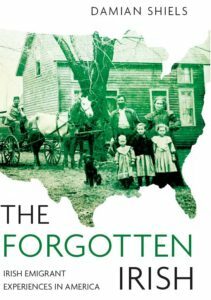 As you will see, they provide us with a tremendous amount of information on the O’Donnell family in Ireland and America, and also reveal aspects of the Donegal immigrant community of which they formed a part. After John’s death, his mother Elizabeth applied for a pension, stating that her son had been her main financial support. Our first affidavit dates to December 1862, some three months after John’s death. It carries the statements of three men from Luzerne County, Condy O’Donnell, Patrick Gallagher and Peter O’Donnell, all of whom attested to John’s illness on his return for the army. The purpose of this evidence was to prove that John had contracted his illness in the line of service (as opposed to afterwards). Personally appeared before me Condy O’Donnell who being duly sworn according to law deposeth and saith that he was acquainted with John O’Donnell the son of Elizabeth O’Donnell the applicant in the above case. That he saw the said John about the last of June 1862 immediately after his return from the army. He appeared to be very sick and miserable. He had a large swelling under his ear and complained of pain in his breast. From his appearance I thought that he would not live long. He last saw said John on the 4th day of July. That at said time he looked no stronger or more healthy than when he first saw him. Sworn & subscribed before me this 27 day of December 1862. Patrick Gallagher being duly sworn saith- I was acquainted with John O’Donnell. I saw him the night he came back from the army. He was very weak and sick, so weak that he could scarcely walk. He said he had lost his health in the army had been discharged and thought he would not live long. He stayed at my a part of the time until he left WIlkes Barre for Clifton. He left for Clifton about the 16 of July. He was no stronger when he left than when he first came. I did not think he could live long. he was entirely temperate and of good habits in every respect. Sworn & subscribed before me this 27 day of December 1862. Peter O’Donnell being duly sworn saith, I was acquainted with John O’Donnell. I saw him in the month of August a few days before he died. He was in bed and so weak he could hardly talk. I asked him what ailed him. He said “the lump on his neck had fell down in his throat” and he had a very bad pain in his breast and breathed with great difficulty. He had no lump on his neck before he went to the army but was strong and active. His habits were very temperate and good in every respect. I think he died of the disease contracted while in the service. He had the attention of a Physician but could get no relief. I have no interest direct or indirect in the prosecution of this claim. Sworn & subscribed before me this 27 day of December 1862. The next affidavit on the file was deposed the following August, when Peter O’Donnell and Patrick Gallagher again gave evidence. 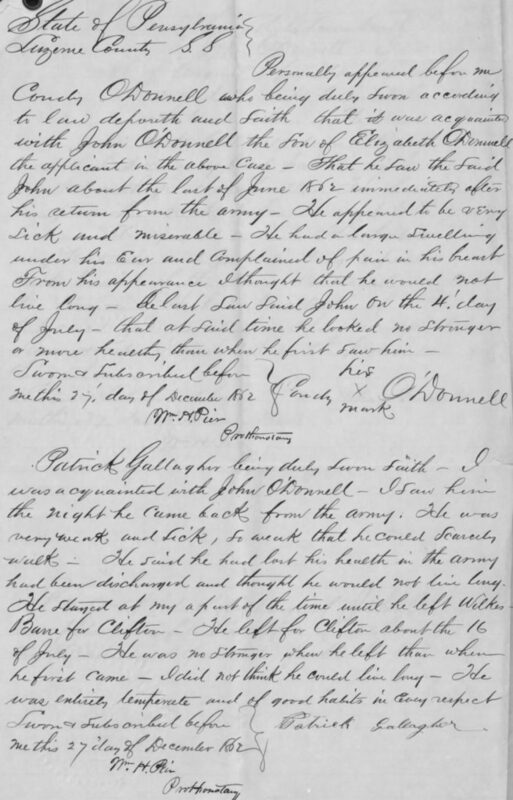 As well as showing that John O’Donnell had supported his mother and had no other dependents, it sought to assist Elizabeth with a major stumbling block she had encountered with her application. It had become apparent that Elizabeth was not a widow, but was in fact married to a man named James McGarvey. The existence of a husband meant that in order to keep her pension claim alive she had to demonstrate that her spouse was either unable or unwilling to support her. The two men sought to do this by recounting the fact that James McGarvey had abandoned Elizabeth, and that they in fact had never met him. Before me…Prothonotary of the Court of Common Pleas of Luzerne County personally appeared Patrick Gallagher and Peter O’Donnell residents of Wilkes Barre Township, in said County and State, persons whom I certify to be respectable and worthy of credit, who being duly sworn say that they are acquainted [with] Elizabeth O’Donnell, the present claimant, and that they were acquainted with John O’Donnell, late a private in Company “A”, 18th Regt U.S. Infantry, who was her son. He died on the 26th day of August AD 1862, which was about a month after he came home discharged. His mother, the present claimant depended on him entirely for support. Before he enlisted in the army he lived with her, and while he was there he sent her a part of his wages, which we know. He had supported her by his work for about six years before he enlisted. Elizabeth O’Donnell has a husband now living. His name is James McGarvey. He married her about eleven years ago and after living with her about a year he left her and she has never seen him since. We have never seen him. He has not lived with her for the past nine years, during which time we have known her. He has not contributed at all to her support during that time. We do not know whether he is living now, or not. They have no interest in the prosecution of this claim. They also state that John O’Donnell left neither widow nor children. He was not married. Before me Prothonotary of the Court of Common Pleas of Luzerne County personally appeared Paul Dunn, whom I certify to be a person of respectability and worthy of credit, residing in Wilkes Barre, Luzerne County, Penna, who being duly sworn says that he knew John O’Donnell, who was a private in Company “A”, 18th Regt U.S. Infantry. That before he enlisted and at the time he was apparently sturdy and well. That he saw him about the 25th day of August AD 1862, when he first came back from the army, discharged. He was then very sick, and of that sickness he died in about a month. He also states that he has no interest in the claim. A month later Peter O’Donnell and Patrick Gallagher were back to give a third affidavit. They reiterated their previous statements, as well as providing details of Elizabeth’s first husband, John’s father. Another man, Darby Farry, also added his mark to the statement. Although we have no details on Darby’s origins, the Ferry/Ó Fearadhaigh is another surname directly associated with Co. Donegal. We Peter O’Donnell and Patrick Gallagher of Wilkes Barre, Luzerne County, Pennsylvania being duly sworn, on our oaths say that we know Elizabeth O’Donnell, that she was married to Patrick O’Donnell in Ireland as we believe. That about eighteen years ago she came to this Country with her son John O’Donnell, the dec’d. That they lived together up to the time of his enlistment in the army. That for the past five years he has supported her by his work. That after he enlisted he sent her five dollars per month, and at one time he send her fifteen dollars in March 1862. That what he sent her was absolutely necessary for her support, to pay her board. That she has no property whatever, and is now supported by her friends, not being able to work. That James McGarvey who married her about eight or ten years ago, left her after he had lived with her a year, and we have never seen him since, nor has he been back, and no one here knows where he is. Also, I Darby Fary of Wilkes Barre, Luzerne County, Penna on my oath say that I know the facts set forth above to be true, being myself personally acquainted with Elizabeth O’Donnell and having been acquainted with her son John O’Donnell and knowing all the facts set forth and we have no interest in the claim. Elizabeth had to do more to prove that she had been married to John O’Donnell’s father. In order to achieve this she had to send back to Ireland for proof of their union. In doing so she revealed for us her precise place of origin in Co. Donegal- Cruit Island. The document also indicates how communications were maintained across the Atlantic, often over decades. 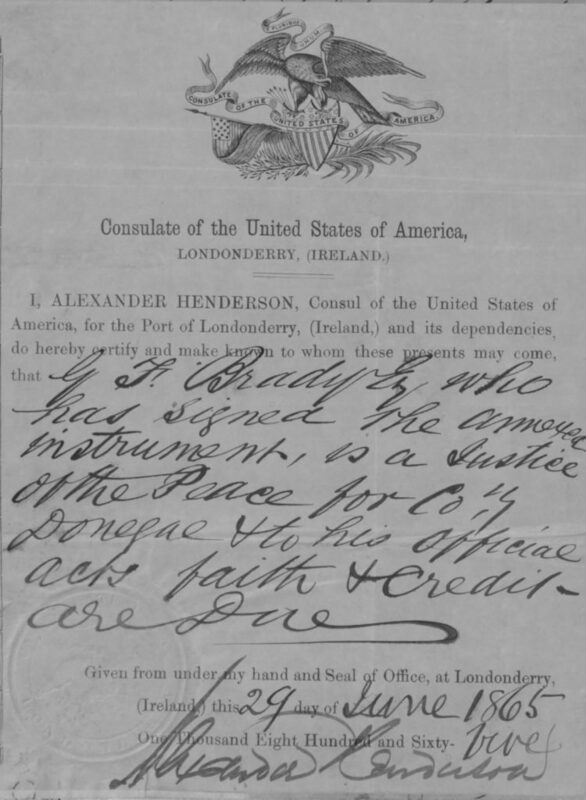 Owen Sharkey, a resident of Cruit who had been at Elizabeth’s wedding, gave a statement attesting to that fact which was forwarded to America through the U.S. Consul for Londonderry. Additionally the local parish priest added an annotation to confirm that the marriage was duly recorded in the parish registers. I Owen Sharkey of Cruit do solemnly and sincerely declare, that Elizabeth O’Donnell formerly of Cruit Island, Co. Donegal, Ireland, but now a resident of Eckley, Luzerne County, Pennsylvania, America, was in my presence married to the late Patrick O’Donnell of the aforesaid Island of Cruit, by the late Revd. Bernard O’Donnell, then Parish Priest, of the Parish of Templecrone in the County Donegal. And I further declare, that John O’Donnell, whom I knew and who, I am led to believe, died while in the service of the United States Government during the late war, was an issue of the said marriage. Personally appeared before me Prothonotary of Court of Common Pleas for said County Peter O’Donnell and Francis Coll citizens entitled to credit and on oath said they were personally acquainted with John O’Donnell private in Co A 3d Bat, 18th Reg U.S. Reg Inf. That at time of enlisting the said John O’Donnell was a healthy man and had been so as long as they had known him. 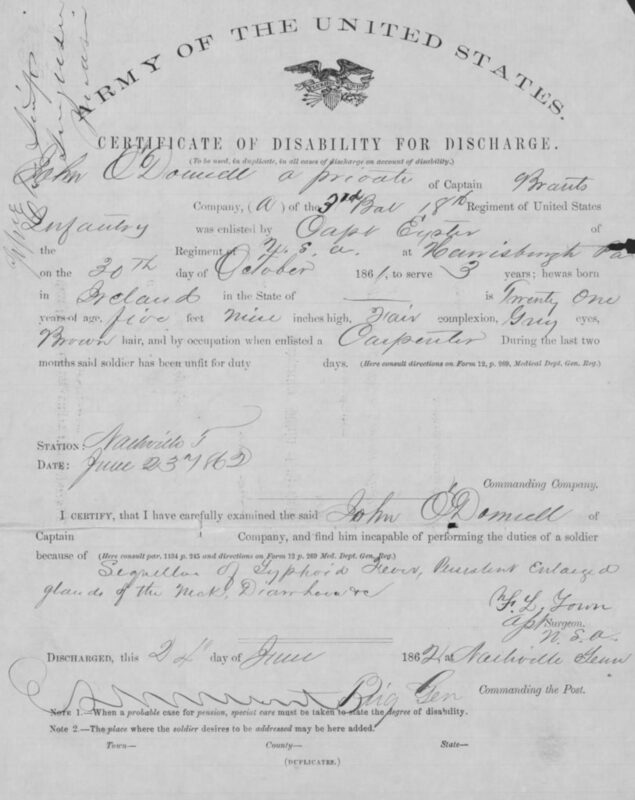 That said John O’Donnell was honorably discharged from military service by reason of Surgeons Certificate of Disability about the 1st of July 1863. That the said John O’Donnell was very sick when discharged. That he died on the 26 of July 1863 of disease of which he was sick when he came home and which he contracted in service and that they have no interest in the claim. Contents made known, marked, signed and sworn to before me this 8 day of August 1865 and I certify I have no interest in this claim. Personally appeared before me Prothonotary of Court of Common Please in said County Peter O’Donnell and Francis Coll, citizens to me well known and entitled to credit and on oath declared that they have been for eleven years acquainted with Elizabeth McGarvey. That she is the mother of John O’Donnell late a private in Co A, 3 Bat 18 Reg U.S. Reg Inf Vol. That Elizabeth McGarvey was formerly the wife of Patrick O’Donnell. That she had by said Patrick O’Donnell six children, Hugh, Patrick and John O’Donnell being three boys and Mary, Bridget and Ann O’Donnell being three daughters. That the father Patrick O’Donnell and Hugh and Patrick O’Donnell two sons died in Ireland. That the mother came to America with John O’Donnell her son and her three daughters aforesaid. That sometime after coming to America Elizabeth O’Donnell widow of Patrick O’Donnell married James McGarvey. That the said Elizabeth lived with the said James McGarvey as his wife for about two years, when owing to James McGarvey’s drinking so much liquor and not working she was compelled to leave him. That she the said Elizabeth McGarvey has not lived with James McGarvey for eight years or more. That the said James McGarvey continued drinking until he finally got deranged and for some three years has been wandering about from place to place, and when last heard from was in Brooklyn N.Y. That he has never contributed to the support of his wife the said Elizabeth McGarvey. That he is worth no property, is not able to, and cannot be made to by law. That the three daughters the said Elizabeth had by her first husband are now married and are unable to furnish anything for the support of their mother. That the said Elizabeth McGarvey is now old and very infirm in health and unable to support herself. That for the last six years she the said Elizabeth McGarvey has been wholly dependent upon John O’Donnell her son late a private in Co A the aforesaid for support. Their knowledge of this arose from the following sources: Peter O’Donnell was working in the mines with said John O’Donnell at Buck Mountain and knew that the said John O’Donnell up to the time of going to war used his wages to support his mother, paid the rent of her house, paid her store bill & c. Francis Coll was with the said John O’Donnell in the same Company and Regiment, and knew the said John O’Donnell sent his money home when he received his pay from the Government to his mother for her to use. That they have no interest whatever in this claim. That her age is about 61 years and that she was born in County Donegal Ireland where she was married to Patrick O’Donnell the father of her son John O’Donnell deceased and where the said Patrick died about 27 years ago. That some time after his death she emigrated to this Country where she again married James Garvey who lived with her for a period of nearly three years at the expiration of which time he abandoned and deserted the deponent and is now supposed to be dead although nothing definite concerning his fate is known. That Garvey has never from the date of their marriage contributed one penny toward the support of this deponent but that she has been entirely dependent upon her said son John O’Donnell for support who contributed all his earnings from his childhood toward her maintenance. 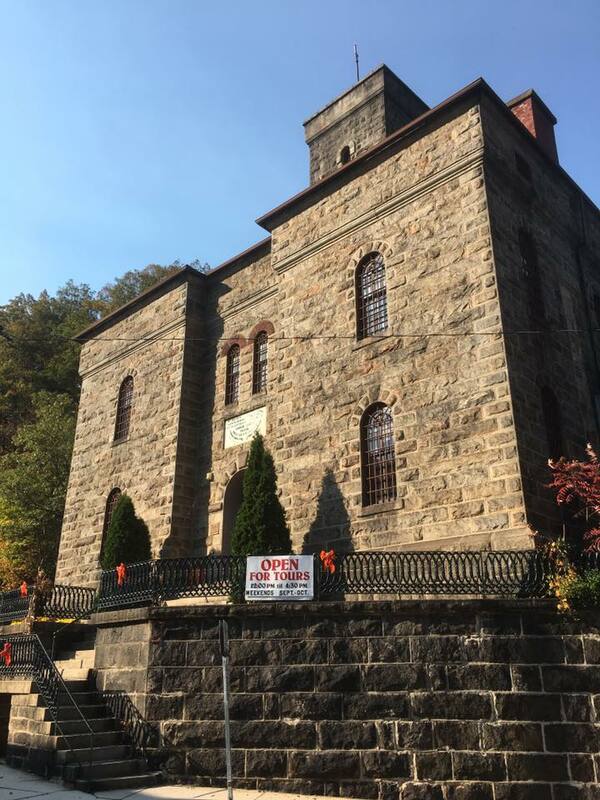 That the said John enlisted in the service of the United States on or about the 30th day of October 1861 and while in said service contracted the disease of which he died at Buck Mountain Carbon County Pennsylvania. She hereby constitutes and appoints Ed C. Dominick of Mauch Chunk, Carbon County, Pennsylvania her true and lawful attorney for her and in her name to prosecute this claim and hereby revokes all powers of attorney by her at anytime heretofore made. Also personally appeared Isabella Kennedy and James Gallagher residents of Mauch Chunk in the County and State aforesaid to me well known and whom I certify to be respectable and entitled to credit and who being by me duly sworn according to law declare that their ages are respectively forty seven and sixty five years and they have been for thirty years and more well acquainted with Elizabeth McGarvey above named that they knew her in Ireland as the wife of Patrick O’Donnell and know the fact that said Patrick died in Ireland. That they have known ever since her residence in the United States and know the fact that she married James Garvey who deserted her about three years after their marriage since which time they have hard nor seen nothing of them. They further swear from personal knowledge that since her marriage and up to the time of his death the said John her only surviving son kept the house & supported her, contributing the rent, food and clothing and all things necessary to her support and this he has done for a period of more than ten years. They further swear that the said Elizabeth McGarvey has no property whatever wither real or personal but is in destitute circumstances and further that they have no interest in this claim. That November Elizabeth got two more Irish-Americans to attest to her son’s health prior to his enlistment, and also procured a statement from the physician, A.A. Ziegenfus, who had cared for her son during his last days. On this 21st day of November A.D. 1867 before me a Justice of the Peace in and for said County personally appeared A A Ziegenfus MD a resident practising physician of Buck Mountain to me well known and whom I certify to be respectable and entitled to credit and reputable and skilful in his profession and who being by me duly sworn according to law declares that he was the attending physician in the last illness of John O’Donnell who died on the 26th day of August A.D. 1862 of Phthisis Pulmonalis (Consumption of the Lungs) and that he has no interest in this claim. On this 21st day of November AD 1867 before me a Justice of the Peace in and for said County personally appeared Patrick Brannan and James Brannan residents of Buckmountain Carbon Co to me well known and whom I certify to be respectable and entitled to credit and who being by me duly sworn according to law declare that they have been for 16 years well acquainted with John O’Donnell deceased and know the fact that previous to and immediately after his enlistment in the service of the United States he was a strong healthy and robust man, a laborer by occupation and without any indication of disease and that he returned home after his discharge from said service in a dying condition, and further that they have no interest in this claim. The final affidavit on file dates to July 1869. Again the first deponent was Elizabeth, supported again by James Gallagher of Mauch Chunk and this time by another new deponent, John Gallagher, presumably another Donegal emigrant. On this Seventh day of July AD1869 before me the Prothonotary of the Court of Common Pleas in and for said County. Personally appeared Elizabeth Garvey a resident of Buck Mountain in the County of Carbon and State of Pennsylvania aged about sixty six years who being first duly sworn according to law doth on her oath make the following declaration in order to obtain the benefits of the provisions made by the Act of Congress approved July 14th 1862: That she is the widow of Patrick O’Donnell and mother of John O’Donnell who was a private in Company “A” of the Eighteenth (18th) Regiment of United States Infantry in the war of 1861 who died at Buck Mountain aforesaid on the 26th day of August AD1862 by reason of disease contracted in the service of the United States and line of his duty. She further swears that her husband the said Patrick O’Donnell to whom she was married in the year 1826 died in Ireland about the year 1840 and that she was again married to James Garvey in June AD1852. That the said James Garvey lived with her for the period of two years and ten months at the expiration of which time he deserted her and she has neither seen nor heard of him since and verily believes that he is dead. That she said since his desertion of her [he] has never contributed anything toward her support and since that time she has been dependent upon her said son John. She further declares that her said son upon whom she was wholly or in part dependent for support having left no widow or minor child under sixteen years of age surviving but having died unmarried and leaving no child declarant makes this application for a pension under the above mentioned Act and refers to the evidence filed herewith and that in the proper department to establish her claim. She also declares that she has not in any way been engaged in or aided or abetted the Rebellion in the United States. That she is not in the receipt of a pension under the 2d section of the Act above mentioned or under any other Act nor has she again married since the death of her son the said John O’Donnell. 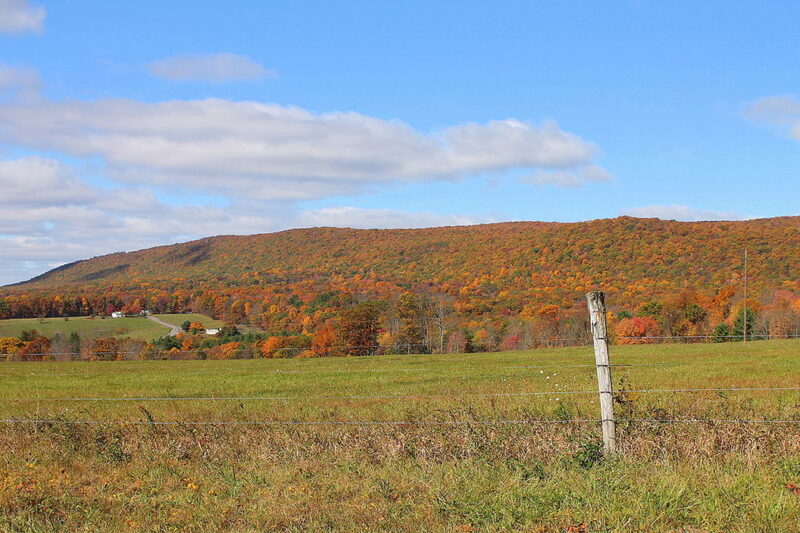 That her post office address is Buck Mountain, Carbon County, Pennsylvania and she hereby constitutes and appoints Ed C Dominick of Mauch Chunk, Carbon County, Pennsylvania her true and lawful attorney for her and in her name to prosecute this claim and further that her maiden name was Elizabeth Campbell. Also personally appeared John Gallagher and James Gallagher persons to me well known and whom I certify to be respectable and entitled to credit and who being by me duly sworn according to law say that they were present and saw Elizabeth Garvey make her mark to the foregoing declaration and they further swear that they have every reason to believe both from the appearance of the applicant and their acquaintance with her that she is the identical person she represents herself to be and further that they have no interest in the prosecution of this claim. And the said James Gallagher further swears that he and the said Patrick O’Donnell were born and brought up within three miles of each other in Ireland, that they were close friends while in the Old Country and he distinctly remembers the fact of the marriage of Patrick O’Donnell and Elizabeth Campbell though he was not present at the ceremony. The said Patrick died as this deponent is informed in the Old Country in the year 1840- his widow the said Elizabeth came to this country about twenty years ago and married James Garvey who deserted her a short time after their marriage. They further swear that the said Elizabeth was dependent upon her son the said John to support for at least the period of two years previous to his death contributing regularly to her support a large proportion of his wages. That she is not now nor has she been since deserted by the said Garvey possessed of any property but since that time has been dependent and supported by her son. And the said John Gallagher further swears that he saw the said John O’Donnell the day he returned from the army he was then sick and obliged to go immediately to bed at the house adjoining this affidavit’s in the Borough of Mauch Chunk aforesaid. That the appearance of the said O’Donnell was then so altered by illness that this deponent with difficulty recognised him. That he remained at this house for a period of about ten days when he recovered sufficiently to be removed to his home at Buck Mountain where he shortly afterward died, this deponent attending the funeral. Register of Enlistments in the U.S. Army, 1798-1914. Widow’s Certificate 133690 of Elizabeth Garvey, Mother of John O’Donnell, Company A, 18th United States Infantry. Thanks for the information the Irish served valiantly with little or no recognition or reparation. God bless their souls!